ManpowerGroup, based in Milwaukee, Wisconsin, is the world's second largest temporary staffing company (after Switzerland's Adecco). Manpower has offices in 80 countries and territories, but mainly in the United States, France, and the United Kingdom. The company had revenues of $20.8 billion and gross profits of $3.5 billion in 2014, with operating profits of $719.9 million and an overall profit margin of 3.5 percent. $2.3 billion of its gross profits were from its Manpower temp. staffing business. Across all of its divisions, ManpowerGroup reports placing 2.3 million people in temporary, contract, and permanent positions in 2014. Temporary employment has become increasingly common for U.S. workers and agencies like Manpower, Kelly Services, and Adecco "are now among the largest employers in the United States," according to reporting by ProPublica. The company's subsidiaries and divisions include ManpowerGroup Solutions ("large-scale recruiting and workforce-intensive initiatives"), Experis (with a focus in IT, finance and accounting, engineering, and healthcare recruiting), Manpower (temp. staffing), and Right Management (outplacement/career transition services contracted to businesses and educational institutions). Manpower was given the contract for the UK's Working Links "Welfare to Work" program in 1997. 2.2 Skirting Union Opposition by Branding as "Women's Work"
3.3.1 Temp Lobby Drafted 1998 Congressional Bill to Define "Employer"
A Manpower executive sits on the board of the HR Policy Association (HRPA), a trade association. HRPA is a major opponent of the Fair Pay and Safe Workplaces Executive Order, an order issued by President Obama in 2014 that aims to ensure that federal contractors comply with federal wage laws, health and safety standards, and civil rights laws. 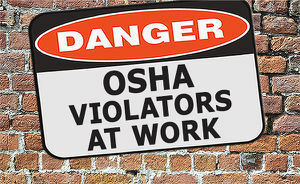 An investigation by the Center for Media and Democracy of OSHA inspection records found that numerous corporations (and/or their subsidiaries)--including Manpower--whose executives sit on the boards had been cited for serious and repeat violations of OSHA standards from 2013-2015 that would be reportable under the EO. A "serious" violation indicates "a substantial probability that death or serious physical harm could result" from a hazard, a "willful" violation is cited when "evidence shows either an intentional violation of the Act or plain indifference to its requirements," and a "repeat" violation indicates the business "has been cited previously for a substantially similar condition." In 2015, ManpowerGroup Inc. received $4.4 million in federal contracts, according to USA Spending. Between 2013-2015 subsidiaries ManpowerGroup US Inc., Manpower US Inc., and Manpower, Inc have incurred 1 “Serious,” 1 “Repeat,” and 9 “Other-than-Serious” OSHA violations and $43,120 in penalties. These include violations related to incidents involving a worker who needed surgical treatment after receiving chemical burns on the job in 2014 (Manpower US Inc.) and another who was hospitalized after a welding accident in 2013 (Manpower Inc.). 05/18/2015: Following a referral inspection at a site in Temple, TX, ManpowerGroup US, Inc. was cited for 1 “Repeat” violation and a penalty of $38,500 for failing to provide the guards that would protect workers from hazardous machines. The company is contesting the violations. 07/08/2014: Following an inspection prompted by a complaint at a site in Albany, OR, Manpower US, Inc. was cited with 1 “Serious” and 1 “Other-than-Serious” violation and a fine of $300 for violating OSHA’s requirement that workers be trained on “The physical, health, simple asphyxiation, combustible dust, and pyrophoric gas hazards...of the chemicals in the work area...”; and rules for workplace safety committees. In January 2015 Manpower Inc. agreed to an $8.75 million settlement with more than 20,000 temp workers in the state of California over claims that they weren't paid on time and didn't receive accurate pay stubs. This case would not trigger specific action under the Executive Order, as it was settled before there was a judgment or merits determination and was based on a state law not yet included within the EO. It is included to give an indication of the company’s lax compliance with other important workplace laws. "Reporters' Guide: Federal Contractors with History of OSHA Violations Battle New Safety Rules," PR Watch, February 16, 2016. "From Receptionists to Rocket Scientists, MANPOWER Undermines Higher Wages," PR Watch, September 3, 2015. "DuPont Rakes in Federal Dollars Despite History of Hazards," PR Watch, February 29, 2016. "Honeywell's String of Dangerous Close Calls Doesn't Stop Flow of Taxpayer Dollars," PR Watch, March 9, 2016. "The Safety Violations Billion-Dollar Contractor BAE Systems Should Have to Disclose," PR Watch, March 16, 2016. "Shaky Safety Record for Billion-Dollar Contractor AECOM Overseeing Nuclear Facilities," PR Watch, March 31, 2016. "Acting Responsibly? Federal Contractors Frequently Put Workers' Lives and Livelihoods at Risk," U.S. Senate Health, Education, Labor, and Pensions Committee, Tom Harkin, Chair. December 11, 2013. "At Our Expense: Federal Contractors that Harm Workers Also Shortchange Taxpayers," Karla Walter and David Madland, Center for American Progress, December 2013. Occupational Safety and Health Administration, OSHA homepage. Federal Contractor Misconduct Database, Project on Government Oversight. Temporary employment is increasingly common for U.S. workers. The United States had more than 2.7 million temp workers in 2013, and nearly one-fifth of the growth in jobs since the 2008 financial crisis has been in the temp. sector. The American Staffing Association (the temp. sector's trade association) estimates that one-tenth of workers find jobs through staffing agencies like Manpower each year. Pro Publica reports that "temporary work has become a mainstay of the economy," filling positions "in the supply chain of many of America's largest companies -- Walmart, Macy's, Nike, Frito-Lay," etc. Temporary workers earn an average of 25 percent less than equivalent permanent workers. "About 14 percent of auto parts workers are employed by staffing agencies today. Wages for these workers are lower than for direct-hire parts workers. [...] Estimates based on U.S. Census Bureau data [...] indicate that auto parts workers placed by staffing agencies make, on average, 29 percent less than those employed directly by auto parts manufacturers." "Phillip Hicks explained to The Washington Post that his only option for a job at a Toyota plant in Georgetown, Kentucky was through the staffing agency Manpower, Inc. Manpower assured Hicks that he would be able to switch to Toyota payroll after a year or two, promising a doubling of his salary from $12.60 to $24.20 an hour and gaining benefits. But after four years, Hicks was still waiting for a permanent employee position, unable to afford health benefits for his family or take more than three days off per year without risking his job, because of a punitive leave policy that only applied to 'temps.'" Skirting Union Opposition by Branding as "Women's Work"
Being founded at a time when labor unions were at their most influential, temp. agencies like Manpower and Kelly Services avoided union opposition by strategically presenting temporary work as "women's work" in advertising, which suggested that temps were housewives working for extra spending money, according to Erin Hatton, Assistant Professor of Sociology at the State University of New York, Buffalo, writing for the New York Times. "In 1961 alone, Manpower spent $1 million to put its White Glove Girls in the Sunday issue of big city newspapers across the country" (about $7.8 million in 2015 dollars), Hatton writes. With the help of these gender stereotypes, temp. agencies established "a new sector of low-wage, unreliable work" that was exempt from many of the protections won by labor unions in other parts of the economy. By the early 1970s, temp. agencies were promoting what they called "a lean and mean approach to business that considered workers to be burdensome costs that should be minimized," with the help of ads like one by Kelly Services advertising "The Never-Never Girl," who "Never takes a vacation or holiday. Never asks for a raise. Never costs you a dime for slack time. (When the workload drops, you drop her.) Never has a cold, slipped disc or loose tooth. (Not on your time anyway!)" Manpower Inc. reported $40,000 in contributions to federal candidates in the 2014 election cycle, all from individuals affiliated with Manpower (not the company itself). Eighty-eight percent went to Democratic organizations and candidates -- including $15,000 to the Democratic Party of San Diego County -- and 11 percent went to Republicans. Manpower received $648,000 from the state of Colorado between 2010 and 2012, representing three training reimbursement subsidies. Manpower does not report any federal lobbying expenses. It is a member of the American Staffing Association (ASA), and helped found its predecessor, the Institute of Temporary Services, along with Kelly Services and other temp. agencies. The ASA reported $120,000 in federal lobbying expenses in 2014 and says it lobbied on two federal bills: H.R.2575, the "Save American Workers Act of 2014" (which would define "full-time" as 40 hours per week); and S.2176, the "Commonsense Reporting Act of 2014." Temp Lobby Drafted 1998 Congressional Bill to Define "Employer"
Manpower and other staffing agencies--working through the National Association of Temporary and Staffing Services (NATSS, now known as the American Staffing Association)--drafted the 1997 "Staffing Firm Workers Benefits Act," then lobbied to push it through Congress, as reported by Mother Jones. The Act would have defined "employer" as "the one who pays wages, withholds payroll taxes, hires and fires, and provides benefits," meaning that temp. agencies would be regarded as temps' employers and making it so that "a company could simply fire large numbers of workers and shift them to the payroll of a temp. employer with inferior wages and benefits." NATSS had made $387,000 in contributions to candidates for Congress between 1992 and 1998, but as Mother Jones found, "targeted their cash very carefully toward House members they [thought could] make a difference on the Staffing Firm Workers Benefits Act." Ed Lenz, at the time a spokesperson for NATSS, acknowledged that the bill as introduced in Congress had been drafted by NATSS, telling Mother Jones, "The bill was introduced in the House in virtually the same form as it was written." The bill stalled in the House Committee on Ways and Means. Darryl Green - Chief Operating Officer - Total compensation: $5,479,310. This includes $23,563 for his children's tuition and $63,867 in relocation expenses. Gina Boswell. Executive Vice President, Personal Care, North America at Unilever. Cari Dominguez. Chair of the U.S. Equal Employment Opportunity Commission from 2001-2006; served in U.S. Department of Labor 1989-1993. William Downe. CEO of BMO Financial Group. Patricia A. Hemingway Hall. CEO and president of Health Insurance Service Corporation. Roberto Mendoza. Senior managing director at Atlas Advisors LLC. John R. Walter. Former president and COO of AT&T. Edward Zore. Former chair and CEO of Northwestern Mutual. Manpower was founded in Milwaukee, Wisconsin in 1948. The company grew rapidly, with 91 branches, 4,000 employees, and annual sales of $12 million by 1956 (about $103.5 million in 2015 dollars). It went public in 1962, at which point it had 20 offices and $40 million in annual sales. By 1967, "Manpower employed more workers than corporate giants like Standard Oil of New Jersey and the U.S. Steel Corporation," according to Erin Hatton, Assistant Professor of Sociology at the State University of New York, Buffalo, writing for the New York Times. In June 2015, Manpower announced plans to acquire the 7S Group, a German HR company "focusing on a number of core sectors including skilled trades, engineering and IT," according to the Milwaukee Journal Sentinel. At that time, 7S Group had approximately 8,000 employees and revenues of around $350 million. The acquisition was expected to cost approximately $153 million and would make ManpowerGroup Germany the third-largest HR company in Germany. ↑ ManpowerGroup, "2014 Annual Report," organizational report, accessed April 10, 2015. ↑ 2.0 2.1 2.2 Michael Grabell, "The Expendables: How the Temps Who Power Corporate Giants Are Getting Crushed," Pro Publica, June 27, 2013. ↑ ManpowerGroup, "Our Brands," organizational website, accessed April 10, 2015. ↑ ManpowerGroup, "Working Links," organizational website, accessed April 10, 2015. ↑ President Barack Obama, "Executive Order --Fair Pay and Safe Workplaces," government document, July 31, 2014. ↑ Occupational Safety and Health Administration, "Inspection Documentation," government documentation, accessed October 2015. ↑ 7.0 7.1 Occupational Safety and Health Administration, "Inspection Detail: 1065212.015 | 317884658 | 317627917 | 316878388 | 317143337 | 315347377," inspection case records, accessed January 2016. ↑ Occupational Safety and Health Administration, "Inspection: 1065212.015 - Manpower Group Us Inc.," inspection case record, database accessed January 2016. ↑ Occupational Safety and Health Administration, "Inspection: 317627917 - Manpower Us Inc," inspection case record, database accessed January 2016. ↑ Lisa Nagele, "Court Preliminarily OKs $8.7 Million Deal Settling Manpower Workers' Wage Claims," Bloomberg BNA, January 6, 2015. ↑ 11.0 11.1 Catherine Ruckelshaus and Sarah Leberstein, National Employment Law Project, "Manufacturing Low Pay: Declining Wages in the Jobs That Built America’s Middle Class," organizational report, November 2014. ↑ 12.0 12.1 12.2 12.3 Erin Hatton, "The Rise of the Permanent Temp Economy," The New York Times, January 26, 2013. ↑ Kelly Services, "The Never-Never Girl," advertisement, 1971, archived on Document Could by Krista Kjellman Schmidt, ProPublica, accessed April 13, 2015. ↑ Center for Responsive Politics, "Manpower Inc., Open Secrets political contributions database, accessed April 13, 2015. ↑ Good Jobs First, "Manpower, Subsidy Tracker database, accessed April 13, 2015. ↑ American Staffing Association, "Research by ASA Members," keyword search results, April 13, 2015. ↑ Jennifer Butsch, "Shaping History: Hall of Fame Inductee Terence E. Adderley -- An Influential Force for More Than 40 Years," Staffing Success Magazine, January/February 2007. Archived by American Staffing Association. ↑ Center for Responsive Politics, "American Staffing Association, Open Secrets lobbying profile, accessed April 13, 2015. ↑ American Staffing Association, "History of ASA," organizational website, accessed April 13, 2015. ↑ 20.0 20.1 Aaron Rothenburger, "Temporary Madness," Mother Jones, October 13, 1998. ↑ U.S. Congress, "H.R.1891 - Staffing Firm Worker Benefits Act of 1997," government record, accessed April 13, 2015. ↑ ManpowerGroup, Executive Leadership, corporate website, accessed April 10, 2015. ↑ ManpowerGroup, "2015 Proxy Statement, corporate SEC filing, March 4, 2015. ↑ ManpowerGroup, Board of Directors, organizational website, accessed April 10, 2015. ↑ ManpowerGroup, "History," organizational website, accessed April 10, 2015. ↑ Staff, "Manpower acquires 7S Group in Germany," Milwaukee Journal Sentinel, June 12, 2015. This page was last edited on 31 March 2016, at 15:05.